Laurie's Blog – may contain science. And lots of other stuff. A team from the University of California, Santa Barbara (UCSB) have answered an important question in LED performance – called ‘efficiency droop’ – which has limited the development of high-performance LEDs, capable of replacing incandescent and fluorescent bulbs. 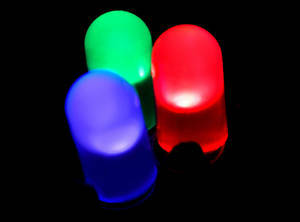 Light Emitting Diodes (LEDs) are highly efficient, durable, and long lasting, and they’ve found uses in everything from remote controls to traffic lights. Unlike incandescent and fluorescent bulbs, they don’t have a filament that will burn out, they don’t get particularly hot, and with a lifetime of tens of thousands of hours, they greatly surpass the performance of an incandescent bulb. But LEDs have traditionally suffered from an effect called ‘efficiency droop’, a drop in the light output of an LED that occurs when a high current is applied to the device. This has meant that an LED’s “cost per lumen” – a metric that reigns supreme in the lighting world – is higher than that of the more traditional large-scale lighting solutions, and this is holding back the more wide scale implementation of this novel light source. Now this may be about to change. In 2011, a team led by Chis van de Walle at UCSB, theorised that behind this droop was a complex non-radiative process called Auger recombination. When this happens, the charge carriers in the LED material, known as electrons and holes, lose energy as heat rather than light. Now a team led by another UCSB scientist, Claude Weisbuch, has proved the theory by analysing the electron emission spectrum of Indium Gallium Nitride (InGaN) LEDs. In their paper, in Physical Review Letters, they study an LED made using thin layers of GaN-based material grown on a sapphire surface. By measuring the LED’s light intensity, while directly observing the energy spectrum of electrons emitted from the device, Weisbuch and his team confirmed that Auger recombination was the culprit of the efficiency droop. The charge-carriers (electrons or holes) were interacting without giving off light, fully accounting for the drop in LED efficiency at higher currents. In LEDs, electrons and holes are continuously created. When they recombine into electron-hole pairs, they release energy in the form of light, making recombination fundamental to an LED’s operation. In nitride-based LEDs, three- particle – or Auger – interactions can also occur. Here, although an electron-hole pair is created, the resulting energy is not released as light, but instead promotes an unstable electron into a higher energy level – i.e. it heats that electron up. As you increase the current applied to an LED, you increase the number of unstable high-energy electrons in your material, increasing the change of forming a three-particle interaction. Although this recombination effect cannot be eliminated, it can be minimised by engineering new materials designed specifically to combat it. So this study is likely to lead to new LEDs with significantly higher light emission efficiencies. The U.S. Department of Energy recently estimated that 12% of total U.S. electricity consumption is is used for lighting, so this development has far wider implications than just the academic. Higher-efficiency LEDs have enormous potential for use in long-lived, reliable lighting for residential and commercial applications. “Direct Measurement of Auger Electrons Emitted from a Semiconductor Light-Emitting Diode under Electrical Injection: Identiﬁcation of the Dominant Mechanism for Eﬃciency Droop”, Iveland, J et al.